Length: 400mm. Image shows painted and assembled kit. The DT-03, already a fine off-road chassis thanks to its long wheelbase and superb stability, is paired with a host of option parts for further-refined performance. Full ball bearings plus metal drive shafts and wheel axles ensure efficient drive from the torque-tuned motor and great durability, while the 4-wheel independent double wishbone suspension features CVA oil dampers, and turnbuckle upper arms allowing camber adjustment. A hi-torque servo saver ensures snappy handling. Chassis, damper stays and front uprights are molded in ever-fashionable black, with an accent provided by gray dampers, red wheels and black lock nuts. 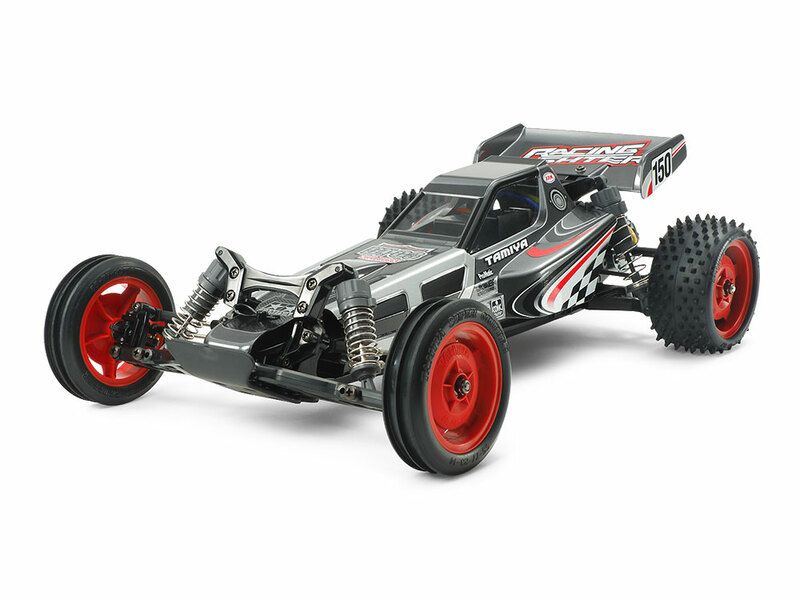 The stylish Racing Fighter single-seater buggy body and its rear wing are molded in polycarbonate. Paint them with Tamiya Color Spray for Polycarbonate and apply the stickers, put them on your assembled Hopped-Up chassis, and get ready for the drive of your life! ★Length: 400mm, Width: 244mm, Height: 134mm ★Wheelbase: 287mm ★Tread: 222mm (Front), 208mm (Rear) ★Tire Width/Diameter: 23/81mm (Front), 41/86mm (Rear) ★Monocoque Frame ★3-Bevel Differential ★2-Piece Steering Tie-Rod ★Front & Rear Double Wishbone Suspension ★Gear Ratio = 8.30:1 ★Torque-Tuned Motor ★Electronic Speed Controller (ESC) is sold separately.